I do not like to eat sweet potatoes but I do like this use of them! 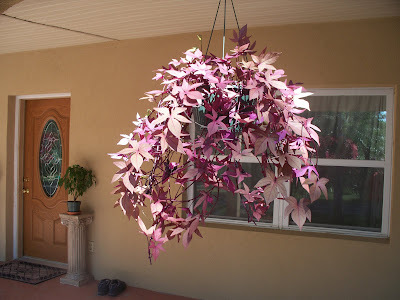 Isn't it just so pretty-all purply/bronzy in color and our gentle, warm breeze just lightly tosses the vines. 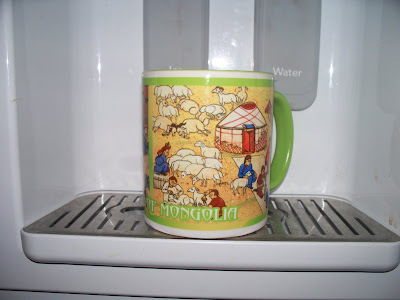 I am going back for more! Bill had bought some excellsior lined baskets for someday and even remembered where he had put them so I will be repotting my new hanging plants later in the day! A fun experiment for me! 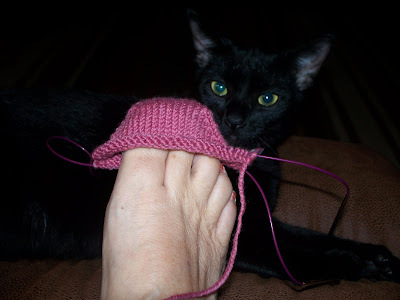 Nyki helped me inspect the second sock when I took a pic for a Ravelry group for Wendy Johnson knitters. She is quite the assistant! 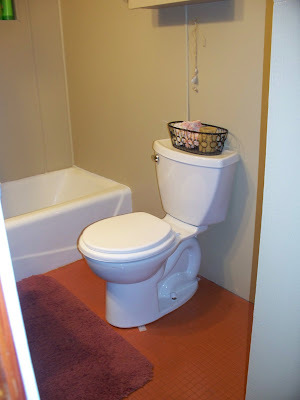 We liked the new toilet so much, we bought another one for the main bathroom! 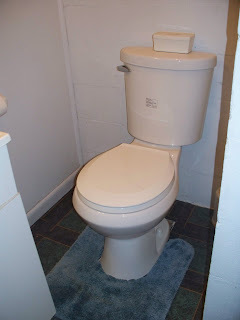 Both toilets were cracked and so the update is a much appreciated albeit needful renovation! 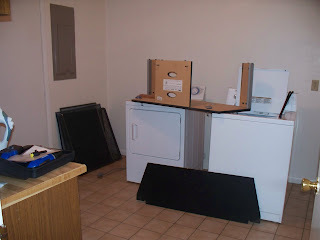 The quick installation of both was more involved than it needed to be due to cracked hardware from the previous owners. We have yet to have a job go quicker than expected! Horray for a husband who doesn't quit! 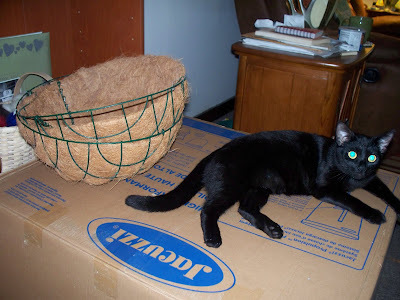 As it is for children, the box has been a source of delight for Nyki! 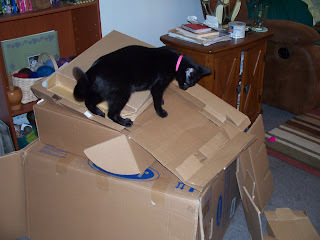 I build the boxes up in a stack and then toss the mousie-she runs straight up the pile and knocks it all down. She feels pretty powerful! 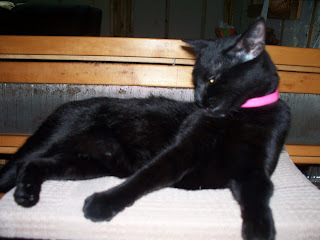 My clean up the clutter traits are warring with the indulge the kitty traits...........I will give her a few days to play! When you share anobsession with friends, they become wonderful enablers. This is a pile of shopping bags which were purchased from the 'Black Market' (it is now legal but kept its old name) ,an open market in Mongolia,When my friend saw them, she knew I would go crazy with them-she not only bought them for me, but then managed to fit them in her suitcase and bring them all the way back! (They weigh 7.5 lbs!) Is this love or what!?! 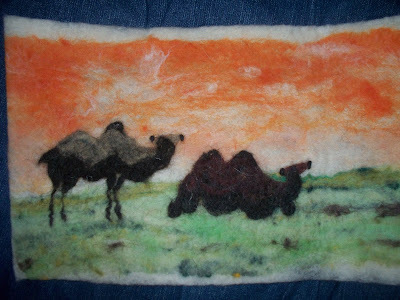 She also brought back more conventional souvenoirs for us, a mug for Bill and a felted wall hanging for me! Sandy, thank you these are amazing! 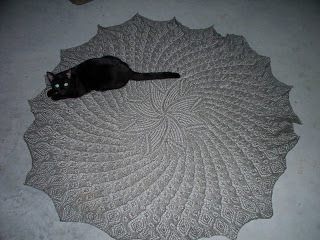 I finished this month's KAL on Ravelry! 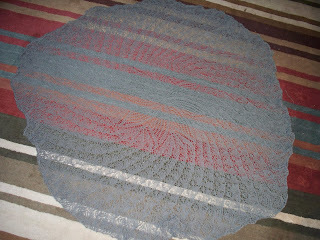 It is knitted on #10 needles, Coopworth fiber, now a sportweight yarn which I had handspun and dyed. It blocked out at 76" at wingtips. This is a bit colorful and I might overdye it to tone it down after it has its maiden wearing! 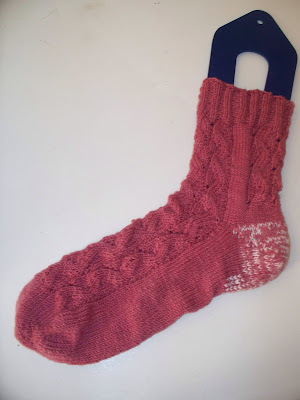 It was a fun knit (and re-knit) and many thanks to the BeginningLaceKnittersGroup for their work. 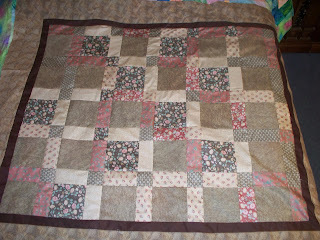 The quilter's block has been overcome! 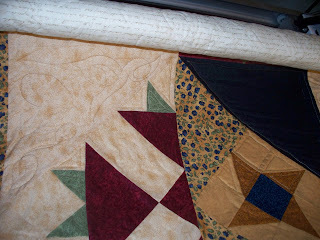 I have been quilting without any more problems with my stitches-it is looking good if I do say so myself. I have another quilting job lined up and I already have the pattern picked out for this one so it will not languish on the frame forever! 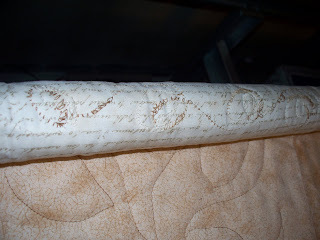 Another incentive, is my own unquilted top that needs attention. 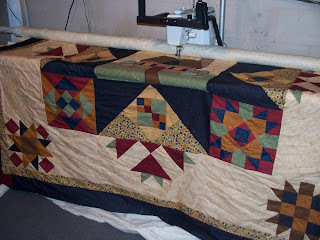 Nice to be busy with the quilting again. 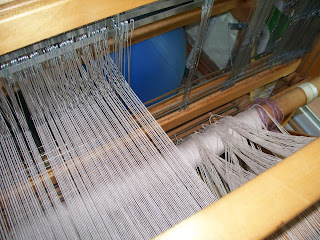 The weaving is going great! 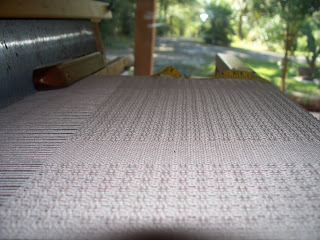 It is such a joy to be able to weave and get the warping over with!!!! This is a lace pattern and it is well, lacey! Nyki jumped up here and tried to act nonchalant over and over! U N D O I N G is Progress, too! If I could, I would post a video of me going backwards and you would have a good idea of what I have been up to! 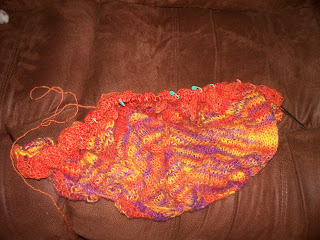 I ripped out the orange shawl! I had only 4 rows to go until completion but it was bugging me. 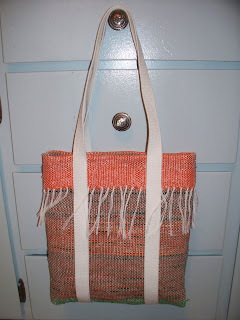 I didn't like the variegated stripe in the middle rows. I ripped it all out and put the variegation in the beginning stockinette area and now am knitting the lacey rows with the plain orange. I am much happier with it! I also changed my needle size-went up from a 7 to a 10 1/2. 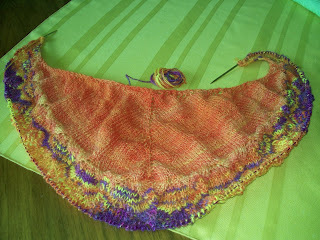 It is a much more open knit now and better for a shawl. 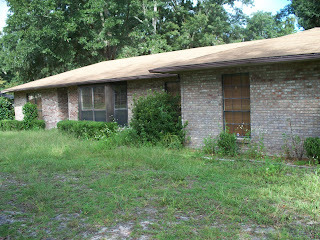 Bill thought I was crazy but I knew I wasn't pleased with the feel ( and look ) of the project so it just had to go. 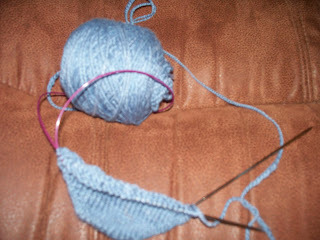 The pattern is very interesting knitting so I didn't mind doing it again! 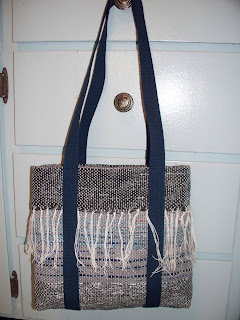 Play out a similar scenario for my weaving! 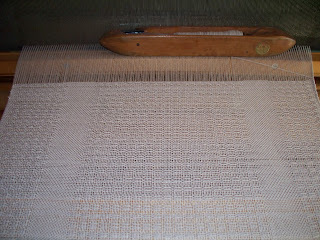 I thought I could make some changes to the threading of the shawl on the loom but as soon as I began to weave, my beginnerness sure made its presence known!!!! I had to unthread the whole thing and am slogging through the rethreading of 262 ends! 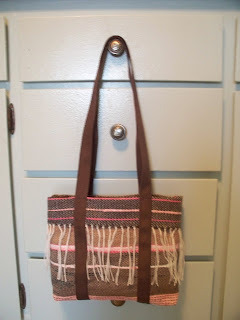 I think I will begin the actual weaving this afternoon! 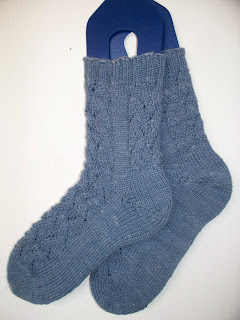 I finished the handspun Finn wool socks. 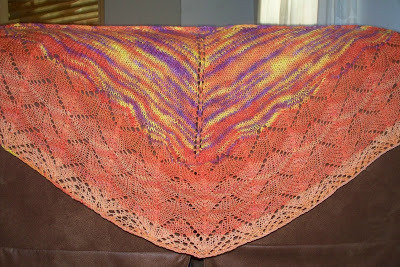 I started a new triangle shawlette (Travelling Woman) now featured on Ravelry as a KAL. I am using some Coopworth handspun and dyed yarn. 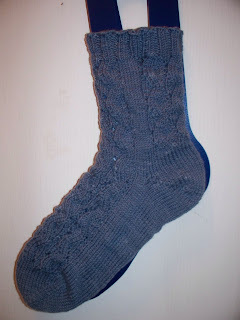 It is a fast knit after working with the laceweight yarns! 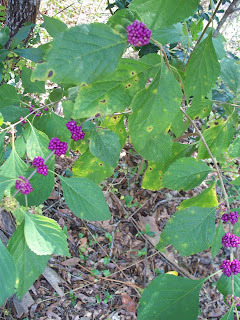 The Beauty Bushes are looking, well, just beautiful! 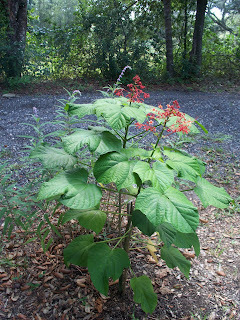 The Pogoda plants are bringing forth rather humble pogoda blossoms after getting hit with the heavy frosts last winter! 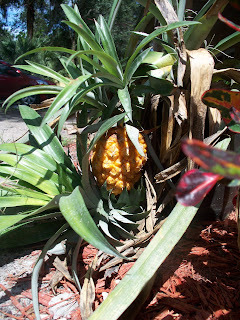 The pineapple is small but ripening just the same! 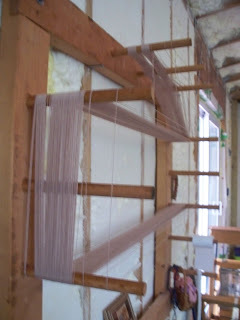 A new project is on the warping board. 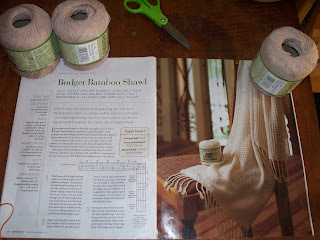 It is from the latest HandWoven magazine. To the loom for warping next! 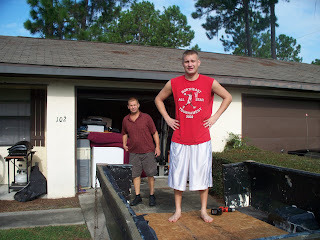 We drove to Lake City and enjoyed another moving day with Matthew and Caleb! 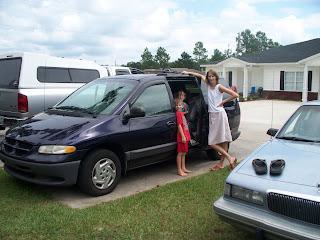 (This makes 6 in the 2 1/2 yrs we have been in Florida!!! but who is counting!) 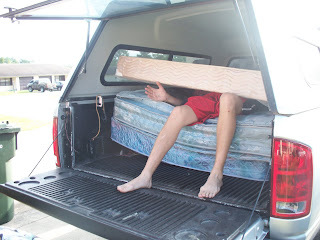 They left Caleb's apartment and moved to a house. It is only 15 mins from the apartment so there was time for lots of trips! 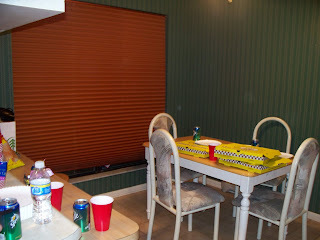 (And the house is now 15 mins closer to us-which whittles the trip down to 1hr and 45 mins!) 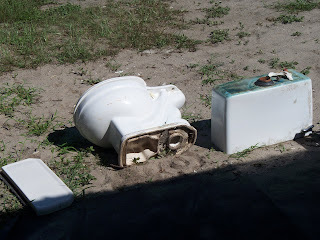 Bill had fixed an old mower to bring as a house warming gift-good thing because it hadn't been mowed for a month! What fun we had and it got even better when Marsel and the kids joined in the fun! She always misses the big moving events and wanted to join in on this one! So glad she did! 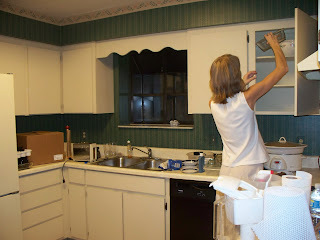 Sure was nice to have another woman to share the cleaning jobs with! 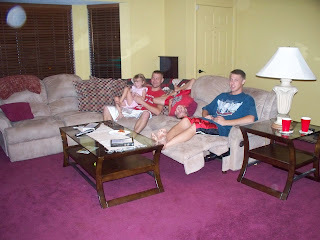 A time for snuggles and wrestling in the new, large, livingroom! 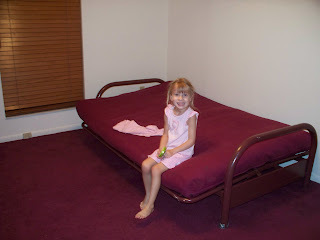 Abigail wanted to stake out her space in the spare bedroom! After a pizza treat, Bill and I got home late last night-satisfied but exhausted! 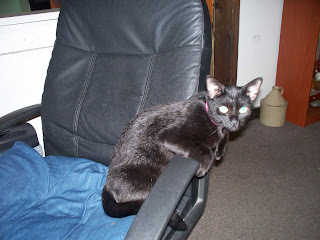 Nyki is glad to have me home and is sticking close this morn-this is how she sits with me in the computer chair! 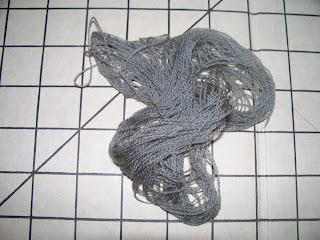 I did get a little nervous while binding off when the skein was dwindling like this! But I kept at it--lace knitting makes me courageous! 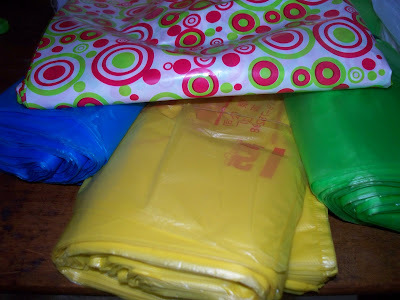 I bought some new webbing when we went to town yesterday so I could finish 3 more plastic bag totes. These are a satisfying weave in every color I choose! And because I needed the flannel backed tablecloth to block out the shawl, I finished up the disappearing 9 patch blocks that were nestled safely in its folds. I pieced the blocks and added the borders. Now I just need to clear off the quilt that is still sitting on the frame. 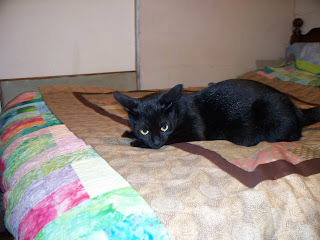 I have a bad case of quilter's block and now that I am on another roll of finishing up projects, will hopefully come up with a game plan and get it executed! 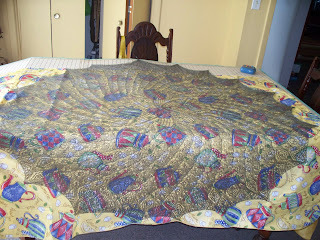 I do not have a deadline on the quilt on the frame (for a friend) so maybe I should set one myself and get it in gear! 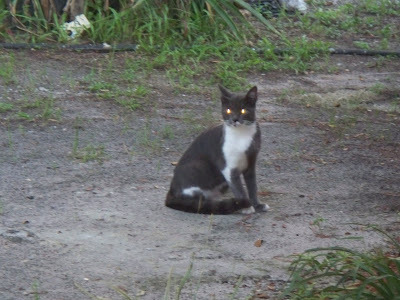 This is one of the stray cats that visit........very sweet, very shy. 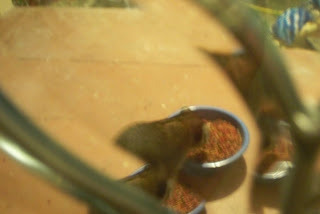 This picture is of a racoon! A large, bold racoon not a cat!